Appliqued should have been hung on the wall to see it to best advantage. 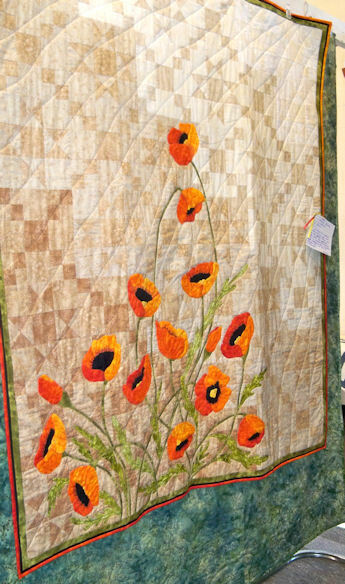 Here are a few of the quilts I took pictures of from the Fenton Quilt Show. It was thoroughly eye candy. I am just going to post a couple of the pictures. There were about 200 and I took a lot of pictures before my camera ran out of batteries. Adventures with a GPS navigation system. I know you do not need to be told what a GPS was but I did. Everybody knew about them but me. Seems like a neat little item, but I have my reservations. 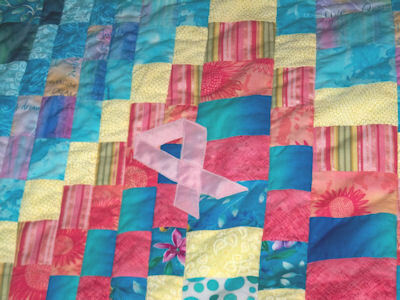 We now have 4 new quilt shops saved in the favorites and two pending. I spent this delightful Michigan end of summer day traveling 100 miles going on our own mini- Shop HOP. with my neighbor Renee. First stop was the Pincushion in Imlay City MI. I have been trying to remember if the store had shrunk or my memory was off. The have about 2000 bolts but I always remembered more fabric. But then I was a new quilter the first time I was at the store and was always overwhelmed by the large selections. I am much more jaded now and not easily overwhelmed. 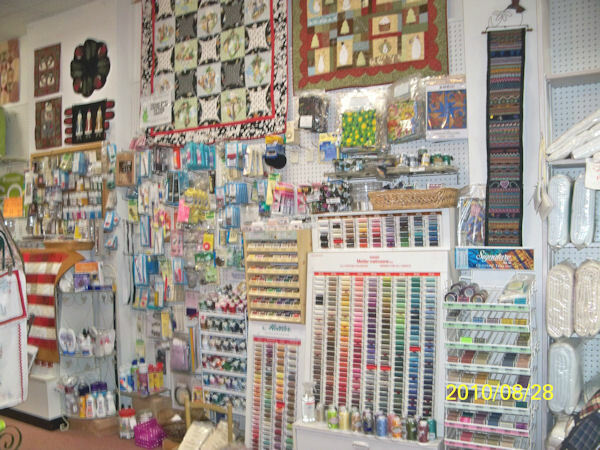 They have compensated by having a HUGE notion wall filled with all the tools a quilter would need. They also had a decent thread display. I spent a lot of time looking over their book and pattern selection. The Pincushion had a lot of full size quilts on display and I really liked looking at them. 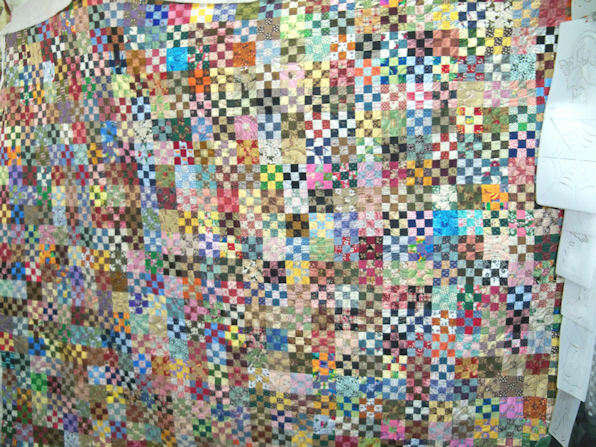 The full size quilts give you a better idea of what your project would look like if you made it or took the classes offered. I had planned to have more pictures of the shops and quilts but there were restrictions on taking photographs. In the back of the store, there was a good size classroom and a long list of classes available. Many bolts of fabric... I estimate more than 1500. Our next stop on our impromptu shop hop was the Sew Together Quilt Shop in Richmond, MI. This shop had a Handi Quilter on display as it was a dealership, so I got to test it out. I have been noticing that many of the shops are branching out into other craft area by including yarns, and wool material. Sew Together offered doll making classes. The ones I saw were very stylized. ( Photo restrictions.) Of course I picked up several cuts of fabric. I am planning another Kool Kaleidoscope Quilt for my daughter and have been picking up fabric in my travels. Renee wants to make a secret quilt for her husband and she has been picking up various fat quarters for the applique. This was a nice shop to visit and we will go back someday in the future. We next drove down to New Baltimore, MI and much to our disappointment got to there quilt shops after they closed. ( It was only 2:15pm on a Saturday afternoon…… BUMMER. ) We did not even get a chance to peek in the windows. So back in the car we went. I have no idea of what kind of fabric or how big the stores were. I could see the long arm machine in Tomorrow’s Treasures it took up the whole front of the window but I could not tell about what else they had in the store., but they advertise as a full service quilt shop. The nice thing about these shops is they are located very near each other. Well we hit the road again and this time we called ahead to make sure the store was going to be open when we got there. We also stopped at McDee enroute, the GPS got cranky when we turned of the road and pulled into McDees for a bathroom break and food. We had to shut her off cause she kept nagging at us. We drove to Marine City where we found Quilting Dreams. ( Nice name for a shop.) The shop was very pretty and what was prettier still was the location right across the street was a shore walk park. You could see the water from the windows. The shop had a very traditional ambiance. The quilt samples on the walls were of traditional blocks and patterns. The store specialized in reproduction fabrics… mostly civil war but other repros too not a batik in the bolts. ( 1000 to 1200 bolts) I recognized some of the big names in repro fabrics Jo Morton and Andover. She also seemed to have a good size collection of coordinates and blenders for her repro fabrics. I was able to pick up and interesting light blue fabric that will go great in my very bright quilt. There was a large class table in the middle of the shop and a customer was doing Brazilian embroidery… very intricate and beautiful work. 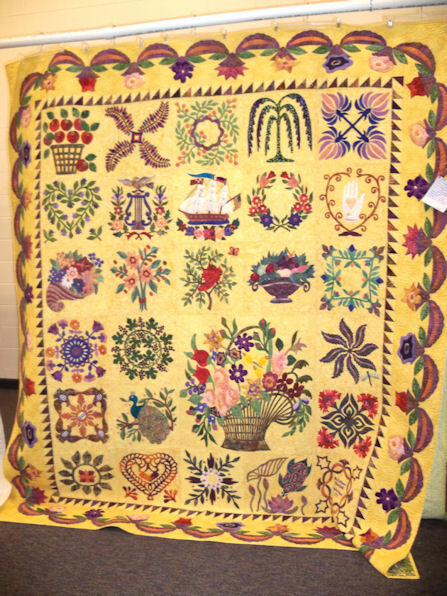 I believe Quilting Dreams plans to help in the revival of the traditional arts of hand piecing, handwork and embroidery. From Marine City we drove to St Clair and this is when I got disgusted with the GPS. I wanted to go the scenic lake shore drive route and because I did not have a street address I could plug in to keep us on the scenic drive. The stupid GPS kept putting us on the free way. Of course, Renee took us the freeway since she was afraid of getting lost on the scenic drive. 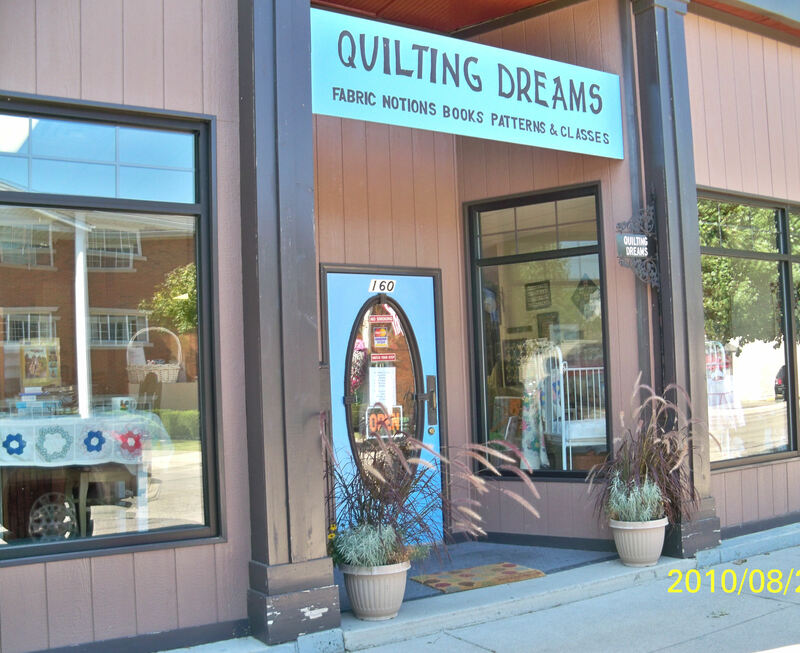 Quilter's Dream in Marine City MI-- I love the name of the shop! This was a beautiful shop, located in a mall setting. It was one of the larger of the shops we visited, well over 2000 bolts. This is a Janome dealership with the complete line of sewing, embroidery machines and sergers. She also had a nice display of sewing tables and cabinets available. Many of them at a decent price, too bad I have a Bernina. There was a large selection of fabrics, Moda, Maywood, Urban Delights. I loved her collection of blenders. I was able to find more colors for my Kaleidoscope quilt. I spent more money then I attend to but then is that what quilters do, to feed there stash. ( This is the topic for a future blog.) Renee fell in love with the sewing machines. I am currently on the hunt of light brights. Have you noticed how hard it is to find good lights that read true? Most of the light brights have a muddied look to them and aren’t very clear. What I am noticing is the true batiks have a muddied, muted look to them because of all the dying process they are put through. Commercial batiks have a much clearer, brighter color to them because I think the traditional screen printing technique is gentler on the fabric griege goods. Regardless, there are very few light batiks or bright fabric, they all read pretty much medium values. Why is that? Our last stop of the day was in Port Huron. We had planned to go to CALLA LILLY SEWING CORNER and SEW ELEGANCE ( Fort Gratiot) which are located just a few miles from Mary Maxims in Port Huron, but they were closed when we got there just after 5pm. So since we were in the neighborhood we went to Mary Maxims. Now I was expecting a store similar to Super JoAnn Fabrics, since MM has been in the mail order business since the early 1950s . I was expecting yarns, beads and craft stuff. Boy was I wrong. 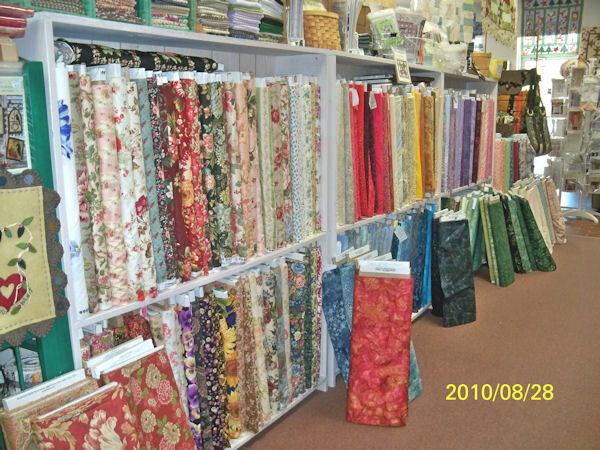 They had all that and over 3000 bolts of quilt shop quality fabric, notions, patterns and equipment. This was an entire separate section of the store…. entirely devoted to quilting. It was fabulous. I saw Moda, Blank, Timeless Treasures, Hauffman and Kaufman fabrics, Amy Butler, flannels and other name brands. And the ladies who worked the floor and cutting tables “talked” quilts. I was thoroughly impressed and plan to go back again. Tips and Hint to unofficial quilt shop hoppers…. 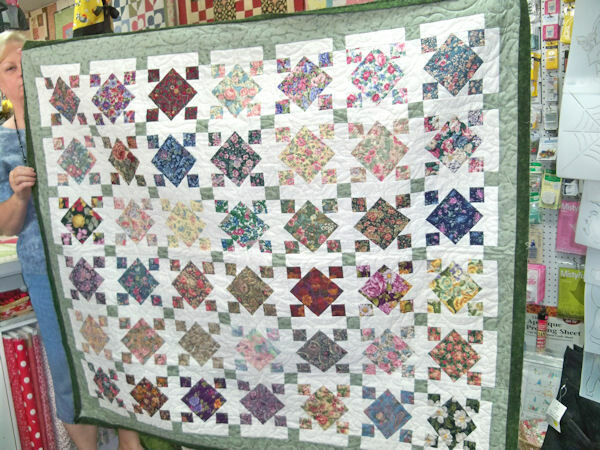 · Plan to get an early start if you want to get to several quilt shop. · Take cash, you will spend less if you have a set budget. Using the credit card makes it too easy to overspend. · Always call ahead to check hours and days they are opened. I always thought 10 am till 4pm was the standard times but quilt shop hours vary widely. · If you are using a GPS have the correct addresses or else you will end up in Timbuktu. · Take a paper map with you too. I finally found the word document and pictures I had gotten ready to post about our mini Retreat. … I had a FABULOUS TIME … quilting and eating and gabbing and sewing and eating some more. Every July Elaine’s Quilty Shop host a Christmas in July Mini Retreat. You are able to sign up ahead of time and join other quilters in a stress free, disturbance free environment. We crank up the A/C to our comfort level, get out our supplies and sew away. 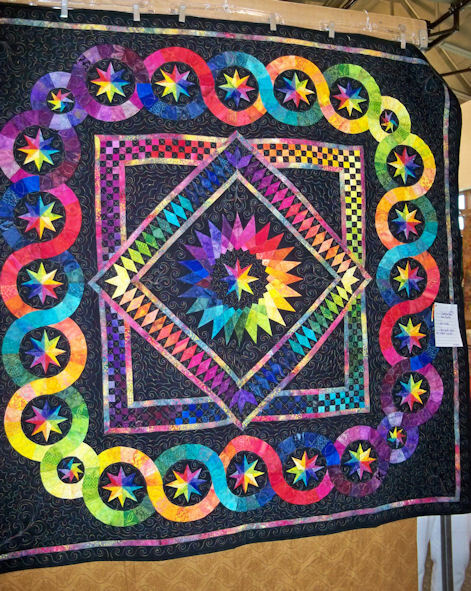 Some beautiful quilts are worked on. Some items are brought in for show and tell. We are offered a great discount on fabric. This year it was a $1.00 off any fabric in the store, and $2.00 off specially marked Christmas fabrics. Their Thimbleberries was also reduced to $5.00 a yard. Needless to say some quilters went home with a much lighter pocket book. But I was good I only bought some Christmas red and Christmas green fabric. Those will go well with what I already have in my stash. Joyce brought in the first of her NINE PATCH series of quilts. I can safely say this is the first of a series since she makes nine patches with 1-1/2 inch blocks like they are going out of style. These are all from her scrap stash. At the end of her sewing sessions sewing up 9 patches. She also says she does this when she is bored with TV, she will just sit and sew patches. 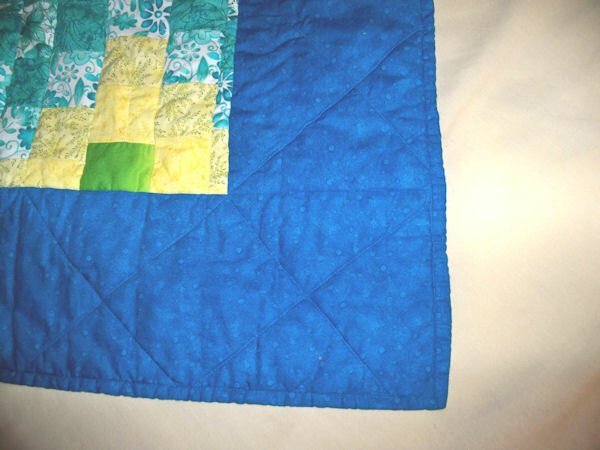 She has joined an exchange with other quilters and they periodically swap 3-1/2 inch finished blocks. Joyce says her goal is to use up all her fabric. I think she just might make it. In the mean time she will have some beautiful quilts made. Everyone worked on something. You have seen my Four Patch Posies Kaleidoscope blocks with the Hip to Bee Square setting on the previous post. I am still working on that. It does not look like I got much done but I was able to sew the first sashing on 30 blocks and that takes time. I am in the process of squaring up my completed blocks then putting them on the design wall. Then the fun will really begin…. designing. Claudia made the cutest purse for her Grand-daughter. The fabric was from our UGLY FABRIC EXCHANGE. This poor yardage went round and round the table till Claudia got it then she sat on it so no one else could take it from her. 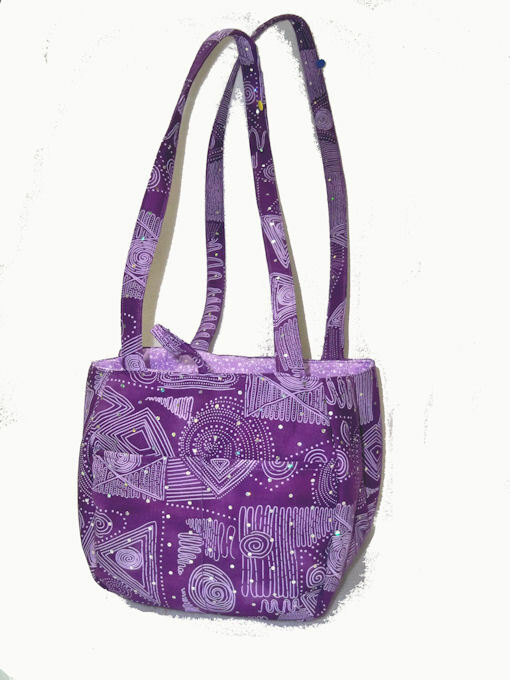 I have posted a picture of the purse. I am wondering what was so ugly about this fabric? Claudia did a lovely job and I am sure her granddaughter all of 11 will love it. This fabric was from the UGLY FABRIC EXCHANGE. It had gone round and round and nobody but Claudia wanted it. NOW everyone wanted to steal the tote after Claudia finished it !! For dinner we had broasted chicken and pot luck fixings. … there is nothing like quilters cooking. I gained 5 pound just smelling the goodies and I later ate my fair share. One of our show and tells…. Joyce is hiding behind the quilt. Critiquing your own work… for the next time. 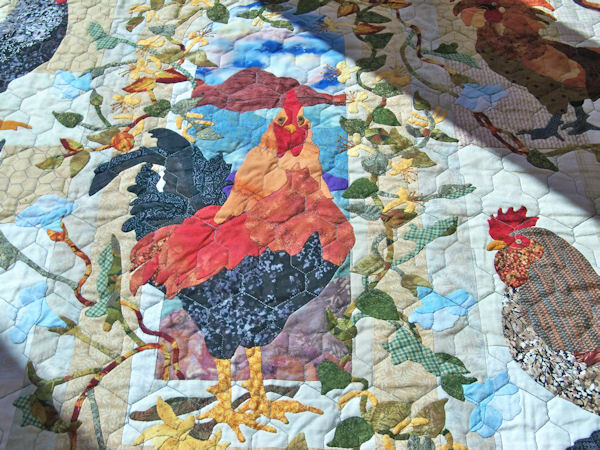 SORRY, I have not posted in a while….. because I have been quilting. Today’s post is the long journey of this UFO from the start 3 years ago till the finished… I have gone from loving to hating back to loving this quilt from Hxxx. It started three years ago when as a new quilter I selected fabrics cut them into 2-1/2 strips sewed them together than not knowing any better sewed them into 80 inch x 72 inch strip sets. NO WAY can I sew a straight seam for 80 inches wide… They wiggled and wobbled all over the place. ( Yes, I was following the instructions in the book as least as much as I understood of them.) I compound the problem by having friends help me sew these long strip sets … Some of the girls sew with EXACT quarter inch seam allowance and some of the girls sewed with scant. The problems this created did not show up until I sewed the strip sets to my batting. I did not like the fabrics in the strip sets when I finally sewed them all together… but I could not tell you why I did not care for the final selection… It was not until recently after taking several color / design tutorials that I realized the color selections lacked VALUE … all my colors were mediums… no darks and no lights. 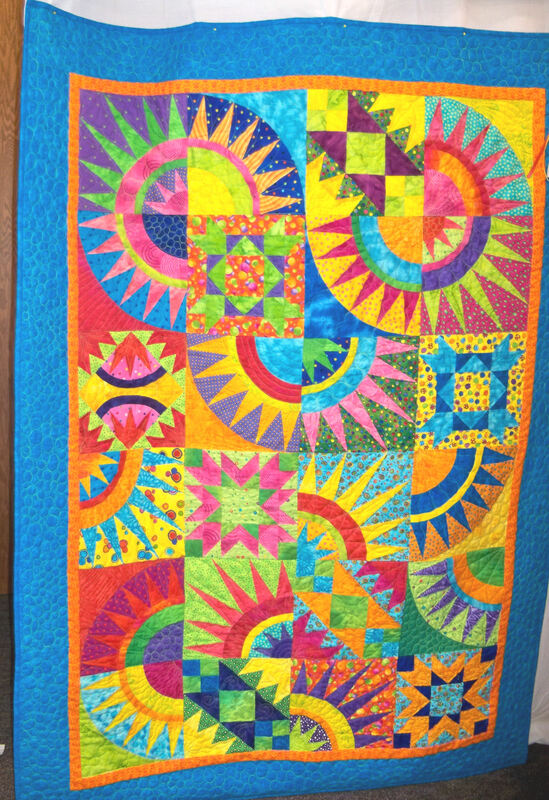 The contrast was very low and the quilt was kind of flat despite the bright colors used. It need the punch of very light and very dark to give depth and sparkle. So this project went into the UFO PROJECT PILE for three years. The project got squirreled away in the basement. Occasionally, I pulled it out and worked on it a little but it would end up back in the UFOs whenever another project came along. 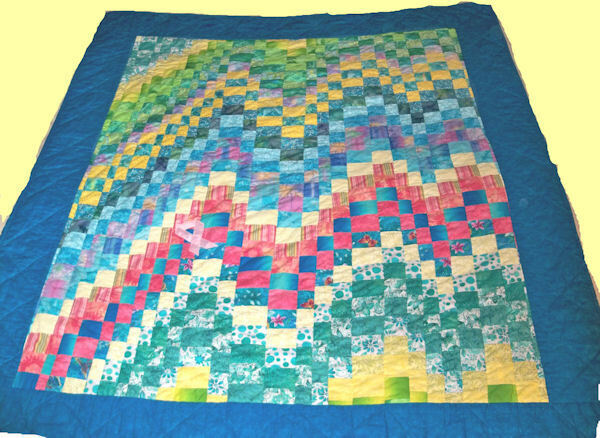 Recently a need arose for a fast quilt to be made so I dug this project out to finish it since the “hard” part was done. Problems plagued this quilt at every step of the way. The strip sets were all suppose to line up so that even though I offset the color to form the over all pattern. The patches were suppose to match up. REMEMBER, I said in the beginning I sewed wobbly strip sets and I had friends help me. This is where the patch work got WONKY. I would cut various width of the strips sets (There is a grid in the book to follow for cutting directions; I just did my own thing and winged it. ) I would then the long strips to the batting and backing material and flip it over, press the seams and then repeat the steps working from the middle of the quilt outward. 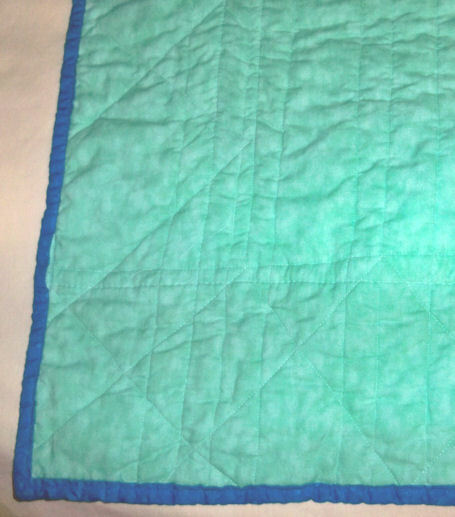 ( Sew and Flip method of quilt as you go.) Since none of the strips sets were exact… the color placement and seams got out of alignment. I also learned if you do not sew and flip carefully YOU would get a hole in your quilt. It gave me a lovely design opportunity… I appliquéd a pick ribbon over the hole in the seam allowance. I kept procrastinating over finishing this quilt even though the deadline was looming. I just did not like the colors as the turquoise blues were fighting with the blue green and kept rattling my nerves. I had no idea what to do to FIX the bad color choices. 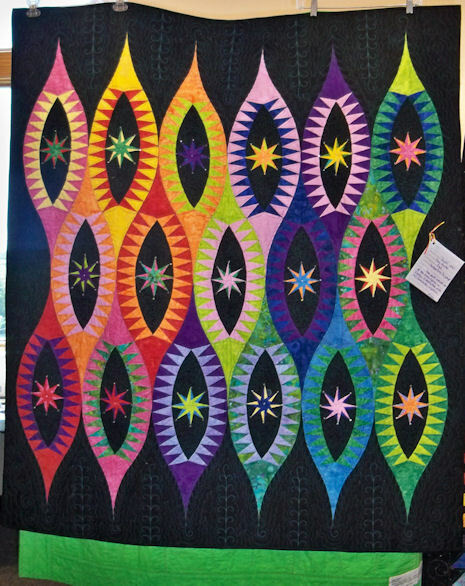 VALUE and COLOR placement is important to add interest, sparkle and depth into any quilt project. Yes most colors play nice together but sometimes they clash…. If is NOT WORK do not be afraid to change your mind. I can not sew long seams accurately. It is better to sew shorter segments and make multiple strip sets. Two width of fabric strip sets would have been more accurate than having a super long strip set of 80 inches. Avoid bowing when sewing long strip sets by changing the directions you are sewing the strip sets together. If they are all sewn in the same direction they tend to develop a rainbow effect. It is difficult to cut a large (length) strip set accurately. I now have a long ruler for this purpose. I also think having several shorter strip sets then sewing them together ( maintaining the color placement) after they are cut would result in more accurate sizes. When I cut really long lengths my strip set could end up 1/4 inch or more too wide. This resulted in wobbling when I sewed and flipped the strips to the batting and backing. The machine quilting on the back showed how off a quilter could get when she sewed these long lengths. The color pattern was very forgiving and it always looked like this was part of the design plan. Since starting this project three years ago I have read other ways of making this quilt top. Traditional piece work to make the quilt top is one method, you would then have to machine quilt the top afterwards. I have also read pattern where the strip sets were made in varying widths of patches so you get a pronounce color shift. I like to think that my bad missed size strip sets were actually planned designs instead of mistakes. Persevere and stop procrastinating. If you trust in the process, if you trust in your self, if you strive for good workmanship. YOU can forgive yourself for lack of knowledge and making mistakes. Mistakes are design opportunities that will result in the quilt being yours instead of a carbon copy from a book, pattern, magazine. Yes FINISHED IS BETTER THAN PERFECT !! !